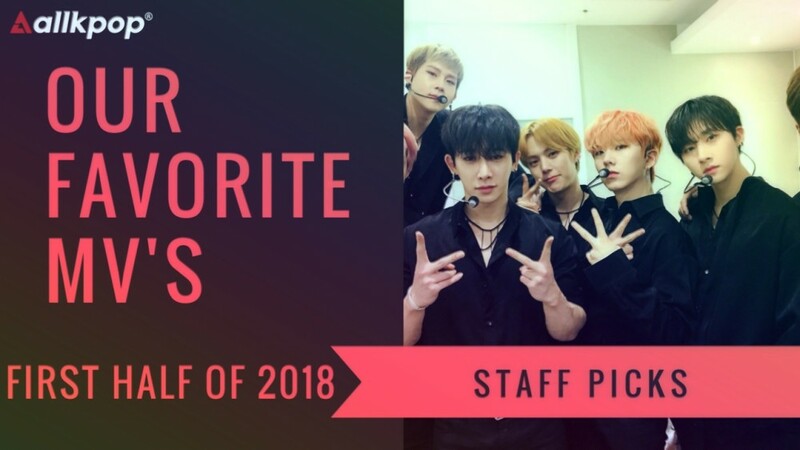 Out of the many amazing MV releases in 2018 so far, here are the favorites of the allkpop�staff! This beautiful MV is centered around Hyungwon, but doesn't focus overly on just one member. It manages to tell a story continued on from their previous song "DRAMARAMA" that doesn't overshadow the song and the choreography and is still attention-grabbing. This is a great song but the MV is also equally as fun. It's full of vibrant colors and depicts a perfect setting for a vacation. After watching this MV, I want to book tickets for Saipan, which is where this MV was filmed. There have been a lot of amazing music videos this year, but watching the MV for Gugudan's "The Boots", I really appreciated how it complemented the song and the Gugudan members exactly. The MV creators combined real-life props and CGI in a way that was impressive and flashy but not overboard, and they make it obvious they actually paid attention to the song's concept and melody. The camera zooms and transitions between scenes are flawless too. Actually, I would choose all of the NCT MVs from their 2018 comebacks as my favorites. But if I had to choose just one, "GO" would be the MV for me. This darker depiction of the youngest members of NCT is a difficult combination to digest, but that is all the more reason to like it! Shot entirely on LA grounds, the MV is far from making the viewer feel at ease. All the choices, including the hand-held camera, hard lighting, and fast editing, support the boys' maturity in a cool way, without making their viewers question their age as much as before. Hyorin ft. Gray's "Dally" is my pick for favorite MV because of the sassy risks she took. Generally, an overtly sexual theme wouldn't be my top pick, but Hyorin stands to empower women by encouraging them to be unashamed of their bodies in this MV. Her incredible confidence, stunning talent, and dancing is what gives this MV a super unique feeling that's incomparable to other music videos that emulate a more cookie cutter bubblegum pop concept. "Dally" shows a new unabashed and bold Hyorin that's never been unleashed before. "Dally" was the risque MV we didn't know we needed in 2018! In honesty, Pentagon never really caught my attention. Until now. As soon as I heard�E'Dawn�clear his throat at�0:12, I knew this was it � the song and the MV that will propel the group to next level. This unique combination of the members' smooth vocals and fun beat was something I haven't heard in a while from K-pop. Also, I have to say Pentagon absolutely killed the choreography; they were by far the best to do the 'shoot dance' (or the 'hammer dance' as they call it in Korea) out of every idol(s) that did it for their comeback; it didn't feel forced and just mashed extremely well with the overall sound. The MV certainly did the song justice by creating an enjoyable, easy-going vibe. Lastly, through this track, I came to a realization just how creative and talented the group can be, especially�Hui�and E'Dawn � these two are going to become big in the near future.